Windows 10 adoption is already slowing down just a matter of weeks after it was released to the general public. StatCounter figures quoted by The Register show that Windows 10 owned 4.95% of the total operating system market at the end of last week and that it grew by 30% in seven days from August 9 to August 16. While the figures are impressive, they are down on the 177% increase seen during its second week in the wild when it went from 1.36% of the market to 3.78% in the same period. In terms of the Windows versions to take a hit, Windows 7 didn't even see a drop (up from 53.46% to 53.5%). Windows 8.1 on the other hand took a substantial hit that saw it go from 15.03% to 14.09% with Windows 8 and XP both seeing very small drops. Even though Windows 10 has seen a drop off in adoption, it still owns almost 5% of the OS market after just two weeks and given that the back to school period has yet to get back into full swing we can expect the numbers to keep rising. 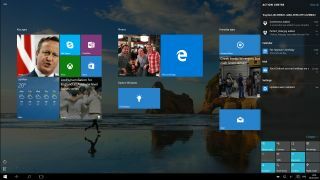 You also have to take into account the traditionally longer time that it takes for enterprises to adopt a new product of this ilk and with all this taken into account there's a great deal of optimism for Windows 10 continuing to grow at an impressive pace.